Joe was raised in a small town near Brainerd, MN, and attended the University of Minnesota where he received a B.S. in Microbiology in 1988. It was while attending the U of M where he decided that he'd put his training to good use and try his hand at homebrewing. He and a friend, Dave Simonson, made a few batches at that time, but after that Joe put his brew kettle aside for a few years. In 1993, while attending the University of Illinois, Joe helped found the Boneyard Union of Zymurgical Zealots (BUZZ) homebrew club in Champaign, IL and served as its President until 1996. It was at this point, due to the suggestion of fellow BUZZards that he should actually be brewing some of his own beer instead of drinking everyone else's, that he began to brew in earnest. He did his first all grain mash in 1994. Joe had the opportunity to be an assistant brewer at Joe's Brewery in Champaign for a year in 1995, working with John Isenhour. “This was an incredible experience! ", Joe says. “I gained a lot of knowledge on recipe formulation as well as gaining appreciation for what goes into scaling up these recipes for commercial production." Over the years, he has also had the opportunity to brew at Mickey Finn's in Libertyville, IL, Blue Cat Brew Pub in Davenport, IA and at Flatlander's in Mundelein, IL. Upon receiving his Doctoral degree in 1997, Joe relocated to the Chicago area to take a position as a Research Scientist at a Food Ingredient manufacturer/supplier. It was at this time that he joined the Urban Knaves of Grain homebrew club. In 1999, the UKG was a 1999 AHA Co-Homebrew Club of Year. Joe attributes much of his success as a homebrewer to his membership in these fine homebrew clubs. “The quality of the beers that brewers make in these clubs is phenomenal, as is the brewer's knowledge base". 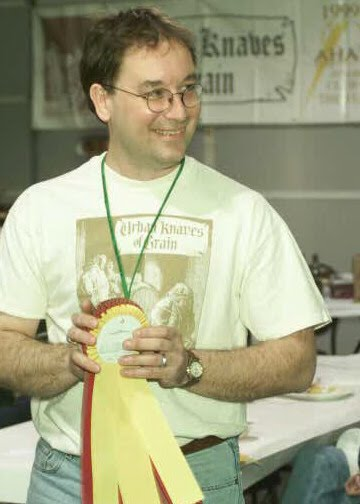 Besides being the 1999 Midwest Homebrewer of the Year, Joe was also honored with the 2000 AHA Ninkasi Award for scoring the most points in the 2000 AHA Finals held in Livonia, MI. Joe received a Gold medal for his IPA, and Silver medals for his American Brown and Bock at the competition. Joe says that there are a number of keys to good homebrewing. Being well versed in a style before first brewing it is very important. This includes reading up as much as possible about that style – recipes, style descriptions, mashing procedure, water chemistry, yeast usage, fermentation temperature regimes and historical information. These are all critical for a brewer to make a batch that emulates a particular beer style. Make sure that you have fresh ingredients. Either using an all grain mashing procedure or using spray dried extract is critical for making a beer with a minimum of off flavors. Use whole hops, not pellets, for both flavor and aroma. When it comes time to pitch, be sure to use an active liquid starter. Water is >90% of your brew. Make sure your water of the proper chemistry and free of contaminants like chlorine. Entering competitions, and utilizing the knowledge of beer judges is also very important. When you receive the scoresheets for your entry in a competition, take the judges comments to heart and tweak the recipe the next time you brew it. Finally, enjoy the beers you brew. It is difficult to brew a beer of a style well if you don't like that style yourself.